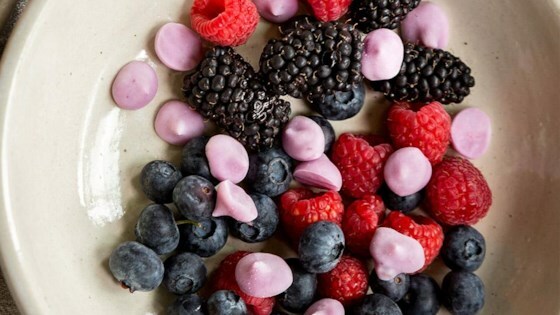 "Pipe dots of your favorite flavor yogurt onto a cookie sheet and freeze--eat them as a snack, on berries or in oatmeal." Transfer the yogurt to a small resealable plastic bag. Line a cookie sheet with parchment paper. Snip off 1 corner of the bag and pipe dots onto the cookie sheet. Freeze until hard, 1 hour. Remove from paper and eat with fingers, mix into oatmeal or throw on top of berries. Fun & frozen PB & J!